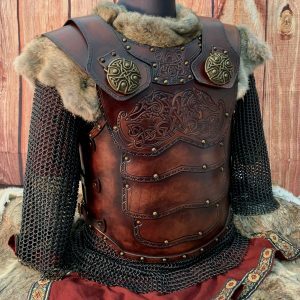 Designed by Black Raven Armoury founder Alex Agricola, the Tribesman Leather Body Armour. Comes adorned with either stunning Wolf or Dragon art. The Tibesman Body Armour is formed to a practical shape suitable for combat comfort and will fit chest sizes ranging from 40 - 46 inches (99 - 115 cm's).